IHC Global Event: Implementing the New Urban Agenda: Can We Really Have It All? “The Habitat III conference in Quito… felt a little like a zoo.” This unconventional metaphor that was shared at IHC Global’s “Implementing the New Urban Agenda” event resonated with panelists and audience members, not because of the visual it may bring to mind of chaos or confusion, but in the way it characterizes a conference that felt electric, frenzied, exciting–the result of a process that brought together stakeholders from all sectors, backgrounds, and regions, and the outcome of which was an all-encompassing new vision for urban development that included the perspectives and priorities of so many different participants. Judith Hermanson, President and CEO of IHC Global, kicked off the event noting the sense of energy that permeated Quito, and asking how we move forward with that same energy and urgency in order to secure a sustainable and inclusive urban future. Following introductions came the screening of a short film by Next City, “The Moment to Get Cities Right: Inside Habitat III, The Urbanization Summit of a Generation”, shot over the course of the four-day Habitat III conference in Quito. Tom Dallessio, President and CEO of Next City, shared Next City’s inspiration for creating the documentary—to continue the conversation initiated in Quito and remind us all of the imperative to act now. 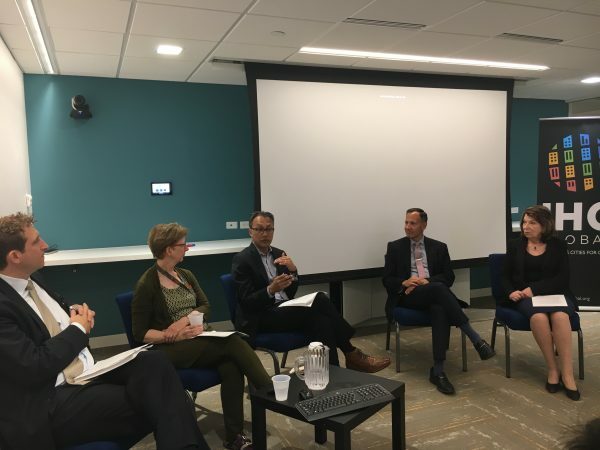 After the film screening, panelists from the World Bank, Inter-American Development Bank, and the WRI Ross Center for Sustainable Cities shared their perspectives on the New Urban Agenda and the path forward. 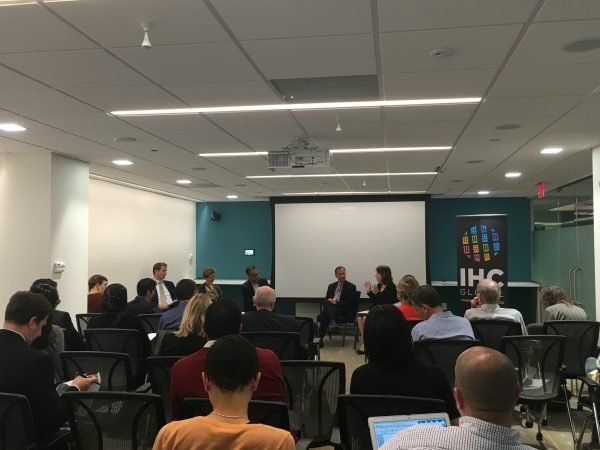 Ellen Hamilton, Lead Urban Specialist at the World Bank, spoke of the importance of recognizing the various scales for implementation—the global scale, the country scale, and the city scale. The city scale is crucial—“In terms of actually getting things done”, Ellen noted, “Cities are very critical.” Michael Donovan, Senior Housing and Urban Development Specialist at the Inter-American Development Bank, echoed the importance of driving implementation at the local level. He also pointed out how significant it was for the New Urban Agenda to talk about climate change, and noted the importance of connecting the NUA with the Sustainable Development Goals, the Paris Climate Agreement, and other international agendas, moving forward. Ani Dasgupta, Global Director of the WRI Ross Center for Sustainable Cities, continued on this point, noting that the New Urban Agenda was able to synthesize three connected goals—the climate agenda, the agenda around informal settlements, and the SDG agenda—all in one place. Judith Hermanson, President and CEO of IHC Global, moderated a rich discussion with the panelists that touched upon the balance between an all-encompassing urban agenda and an ‘implementable’ agenda, the need for locally driven strategies for implementation, and the role of the private sector. The conversation kicked off with an examination of the merit–and potential pitfalls–of having a ‘universal’ urban agenda. Ellen Hamilton noted that the Habitat III process has helped us move from a standpoint that sees cities as the cause of many of our global challenges (and halting urban growth as the solution), to one the recognizes that the future is inevitably urban and cities can be a key part of solutions to global challenges. The New Urban Agenda has helped us to define collectively what ‘good urbanization’ entails. As Michael Donovan put it, the New Urban Agenda is not a strategy document; it is a vision that needs to be translated into local strategies that are specific to each context. Ani Dasgupta reminded that for many cities in the Global South, urban growth is not occurring in conjunction with economic growth. For these cities, which face numerous challenges at once, it will be important to focus on a few core systems—such as transportation, affordable housing, and financing–that are necessary to ‘get right’ in order for urban growth to continue in a prosperous and sustainable way. The conversation also touched upon the role of the private sector and whether or not there is an inherent tension between private sector incentives and more inclusive, equitable cities. Judith Hermanson noted that one criticism of the Habitat III process—which was generally lauded as being an inclusive one—is that the private sector was insufficiently represented. Panelists commented on the need to ‘unpack’ the term ‘private sector’—noting that the role of a small, private housing firm in the Caribbean, for instance, is very different than that of a large, multinational corporation. As 65% of investment in cities comes from the private sector, all agreed that its role in determining the course of urbanization is crucial. Tom Dallessio noted the difference in private sector involvement when it came to the COP21 in Paris, where many leading corporate executives were present and showed that their companies are committed to achieving climate goals. While common perception may be that the private sector does not have the same motivation or incentive when it comes to goals around urban development, Ani Dasgupta argued that successful urban development is of intrinsic value to the private sector—private companies will do better when their employees face limited traffic congestion getting to work, for instance, and when they can breathe clean air. Following the moderated discussion, audience members asked questions and provided comments. The event closed with an affirmation of the importance of the conversation around translating the spirit of the New Urban Agenda into practical implementation, and an appeal for the conversation to continue. Think famine is only a rural issue? Think again.